One of my fellow stampers over at Splitcoast is having knee replacement surgery today. This card will be heading to her! This is totally new territory for this stamper. A long time ago I purchased a box of stamps on E-Bay and this was in the lot. 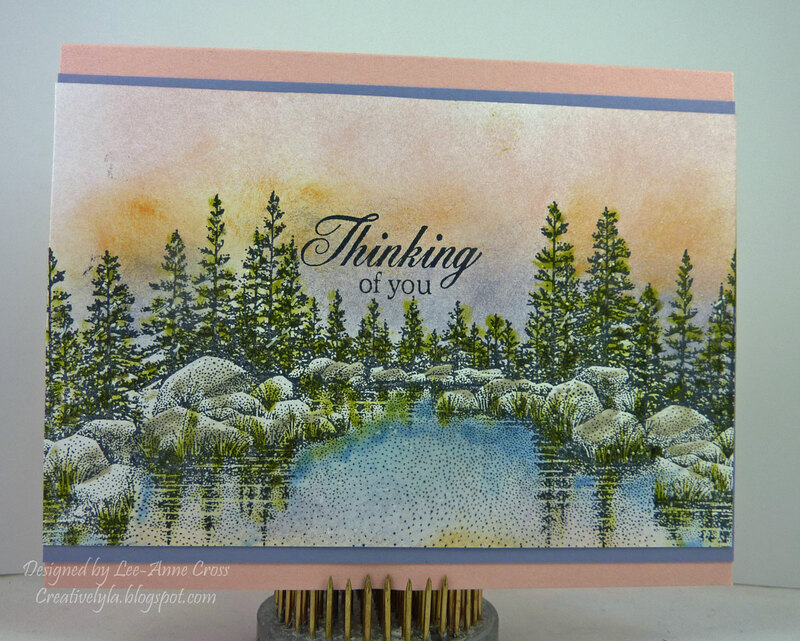 So it was time to dust it off and play along with the Tea Party Challenge and the Color Challenge – both at Splitcoast. The image was stamped in Memento Tuxedo Black and then sponged with Blushing Bride, Peach Parfait and Wisteria Wonder. Next I used my Cut ‘n Dry brush tips to add some color to the trees and grasses- first in Adirondack Lettuce, followed by Adirondack Pesto. Sahara Sand was added to the rocks in the same fashion. Next, I added some Adirondack Stonewashed with a Colorbox foam tipped stylus to the lake area. And then, I used a white gel pen to add some highlights to the rocks and trees. I smeared some Crystal Effects on the lake area but it’s hard to see that in my picture. The sentiment was simply stamped over the scene in Memento Tuxedo Black. It’s going to take some practice to make these scenes come alive. But I think I’m going to have fun with this! There are some very talented artists out there that make these pictures “sing” and as they say practice makes perfect!